Product Size (WxH): 6" x 9"
Board Front: 5 3/8" x 7 1/8 "
Board Back: 5 3/8" x 7 5/8"
Plastic Clip: 3 1/2" x 1"
Screen Charge: $45.00 per color/per location. Pricing includes a 1 color / 1 location imprint on the clip or board only.� Additional color/position run charges listed below. 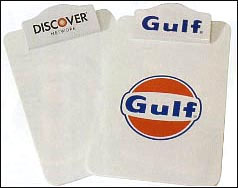 Minimum imprinted order is 50 units with a $50.00 less than minimum charge. Minimum blank order is 30 units.